These little beauties, also known as Pastel de nata are so moreish I’m forever grateful I don’t live near Portugal, I’d be the size of a house! The history of them is very interesting, as they were originally made in FRANCE! Pastéis de nata (the Portugese name means pastry cream as far as I can see, already winning me over) were thought to be created during the 18th century by Catholic monks at the Jerónimos Monastery, Santa Maria de Belém, in Lisbon. These monks were originally based in France where these pastries were found in local bakeries. At the time, convents and monasteries used large quantities of egg-whites for starching clothes, such as nuns’ habits. It was therefore quite common for monasteries and convents to use the leftover egg yolks to make cakes and pastries, resulting in the proliferation of sweet pastry recipes throughout the country. Following the extinction of the religious orders in the aftermath of the Liberal Revolution of 1820, the monks started selling these dainty little pastries at a nearby sugar refinery to bring in some revenue. In 1834 the monastery was finally closed and the recipe was sold to the sugar refinery, whose owners in 1837 opened the Fábrica de Pastéis de Belém. The descendants own the business to this day, a Portugese stalwart. In this recipe I use bought puff pastry, but plan on making them again in a few weeks with homemade puff pastry. My aim was to get the filling right. And I think I did. They were EXTREMELY popular. 1 sheet ready rolled puff pastry, I like the lidl one. 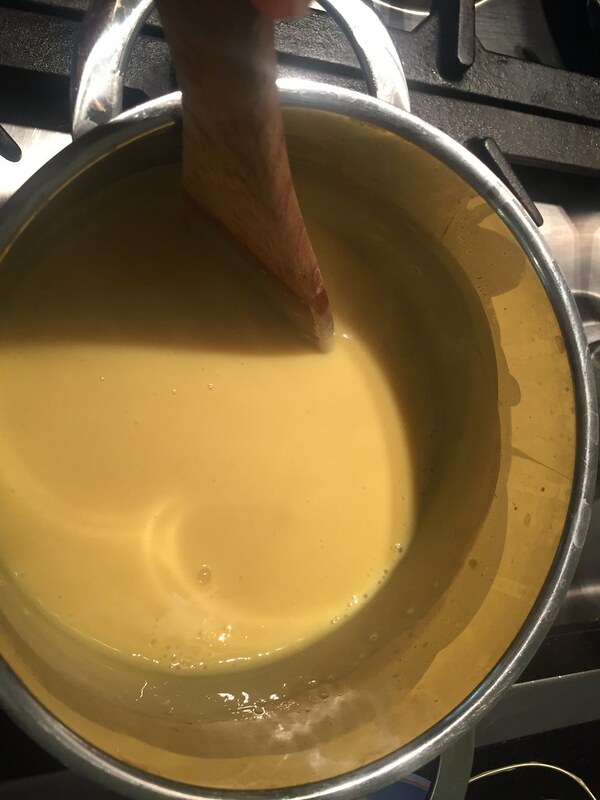 Put the egg, yolks, caster sugar & cornflour in a saucepan and mix well together then gradually add the milk until mixture is well mixed and smooth. Place pan on medium heat and stir constantly until mixture thickens and comes to the boil. Remove pan from heat and stir in your vanilla extract. Put this custard aside to cool. I dust with icing sugar then cover with cling film, to prevent skin forming. 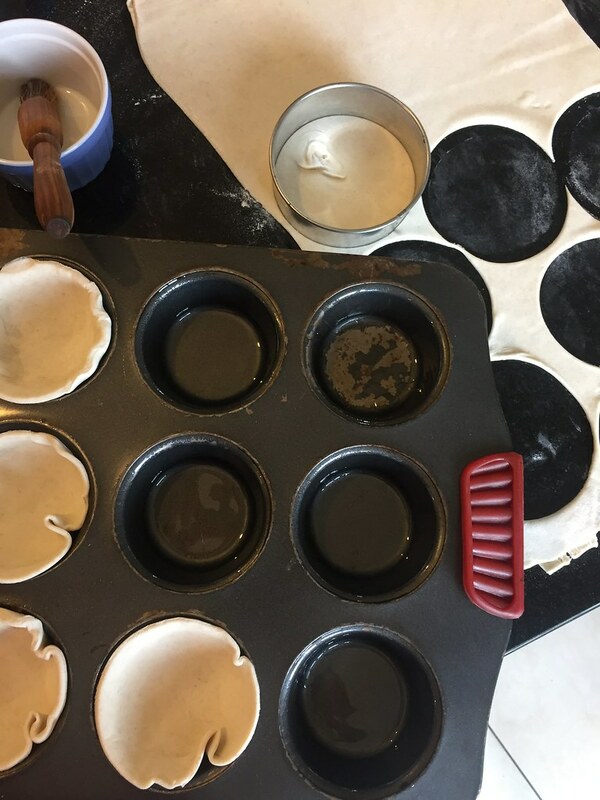 Roll the pastry on your lightly floured counter, and using a cutter, cut this into 12 even sized rounds. 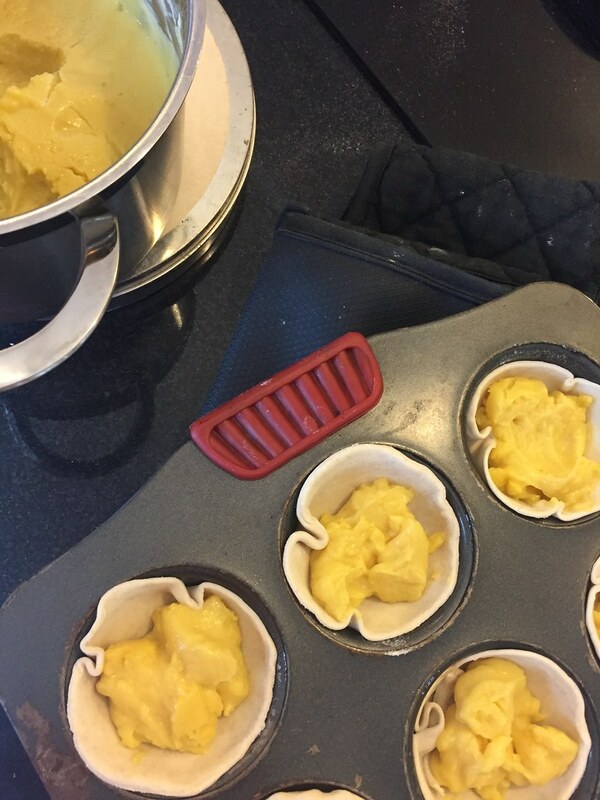 Press the pastry discs into the muffin tin. I like if they are a bit ruffled. Spoon in your now cooled custard, sprinkle over the cinnamon and bake for 20 minutes until nicely golden on top. Leave to cool in the tin for 5 minutes then move to a cooling rack to finish cooling although they can be eaten warm. You frankly won’t be able to stop the hoardes.